22 Aug Perfect storm for wool market. 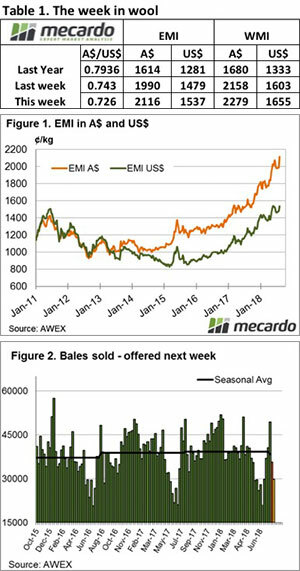 A fall in the Au$, alongside a reduced offering and the prospect of a further reduction in the offerings into the future, conspired to create an almost frenzied wool market this week. The Eastern Market Indicator (EMI) rose strongly from the start and never looked back, gaining 126 cents for the week, to settle at 2116 cents AU$ (Figure 1). On the first day of selling, the EMI set a new record for the largest daily rise, increasing 99 cents. This lifted the EMI above the previous record high of 2,073 set in June this year. The EMI was stronger but slightly more subdued in US$ terms, closing at 1,537 US cents, up 56 cents on the week. AWEX reported that the main drivers of the rally were the reduced offering, concerns about future supply and the benefit of a lower Au$. This is in line with the general explanation of the very good market levels, however, there is also the cyclical effect on the wool market (we are in a super-cycle), as well as a growing appetite for wool from activewear and luxury products. Whatever the reasons, wool producers are in for another good wool cheque for their next wool clip. Sellers embraced the rally, passing in only 1.5% of the offered bales resulting in a clearance to the trade of 35,759 bales. Of note is that this clearance is 13k bales less than last week, and next week the roster is 6.5k bales fewer again. This resulted in dollar value for the week of $87.3 million, with a combined value of $352.1 million so far this season. 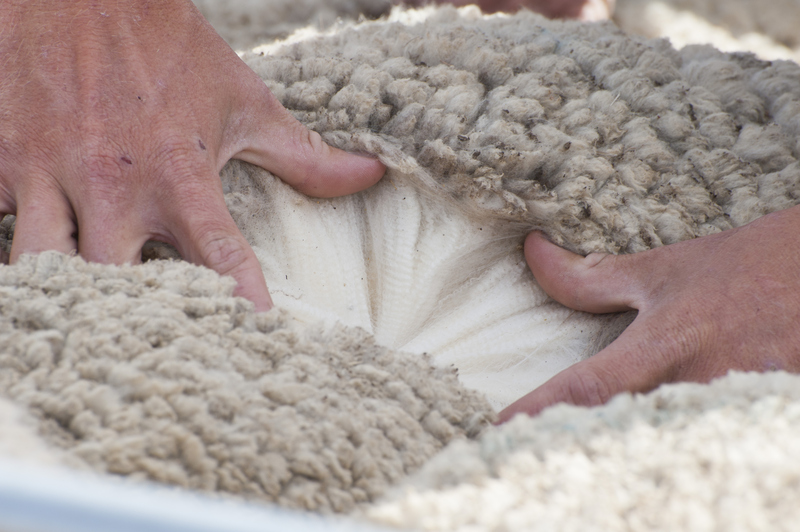 Previously we have reported that better style wool has been more keenly sought and lower styles sometimes overlooked, this week small faults were ignored as buyers sought to secure quantity. Skirtings and Crossbred wool didn’t miss out. After struggling to find support last week, Crossbred types increased across the board of 60 to 90 cents, recovering all of last week’s falls. Merino Cardings also improved on a limited offering with all centres closing higher and above the previously unheard of 1500 cent level. Next week only Melbourne and Sydney are listed to sell. A look ahead shows that roster offerings are declining, with 29,800 bales listed for next week and 34,400 for the following week when Fremantle resumes. As one analyst said when asked what the market will do next; “who knows, we are in unprecedented supply and price conditions”. For what it is worth, we think that in the absence of further currency falls the market will steady next week and could in fact ease albeit slightly.